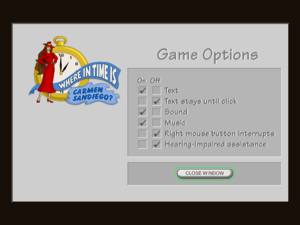 This game was originally released in 1997 as Where in Time is Carmen Sandiego?, and is titled as such in-game. 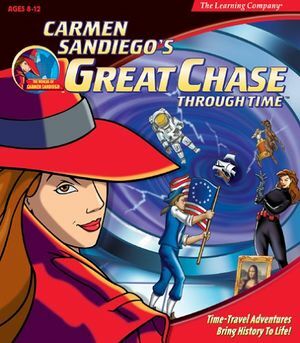 It was rebranded by The Learning Company in 1999 as Carmen Sandiego's Great Chase Through Time. There are issues when attempting to install the game under a 64-bit operating system (see Installing on a 64-bit OS). Even then, the game has issues running under a modern OS (see Issues unresolved). Save game file is mostly encrypted; the only parts of the file that are not encrypted are player names. The colors of kimono jackets and linings in Case 4 are described on mouseover. On/off switch for sound and music. Sound only turns off speech, not sound effects, and does not affect the FMV cutscenes. Is turned on by default. FMV cutscenes do not have subtitles or captions. An issue when running the game on a modern OS is that scenes in the game show up in black except in areas where some sprite suddenly shows up or moves over the black area, such as a character, subtitles, the cursor, or the Chronopedia. Using Windows Compatibility Mode settings does not fix the problem. Players will have to get around this by opening the Chronopedia after every scene change, then clicking and dragging the Time Cuffs around the border where the Chronopedia couldn't reach (since the sprite area of the Time Cuffs is bigger than the cursor). Even then, the Time Cuffs are unavailable in the final case. Since it will happen each time the scene changes, this workaround can quickly get very tedious. Recommended only if you do not have access to a virtual machine with an older OS (see Issues unresolved). When attempting to install the game on a modern 64-bit OS, the SETUP.EXE Autorun from the CD's base folder does not work, as it is a 16-bit program. Insert the (first) disc into your optical disc drive. Open the CD as a folder. Open the Install folder and run SETUP32.EXE. When the 32-bit Autorun menu pops up, select "Install/Uninstall". If the 32-bit Autorun menu does not work for whatever reason, then try using 7-Zip. Open the 7-Zip File Manager and navigate to the game CD's Install folder through 7-Zip. Run _SETUP.EXE (note the underscore) through 7-Zip (see Notes below). At some point, you will be prompted to install QuickTime for Windows 2.1.2, which is required to run the game (modern versions of QuickTime won't work). When it asks you to check for existing versions of QuickTime, click "Skip" and continue installing as normal (you'll want to skip version checking as the QuickTime installer can crash while going though your files, which will cause the game's installer to abort installation). You can now run the game though either the SETUP32.EXE Autorun menu or by going to the game's installation folder and running TIME32.EXE. This fix method was done using the 1999 (Great Chase Through Time) release of the game. There may be differences with the original 1997 (Where in Time) release. _SETUP32.EXE does not work when opened normally through Windows Explorer, as the installer will bring up a severe error that says, "This product does not support Windows NT." This is oddly bypassed when it's opened from 7-Zip or using the normal Autorun menu. Case 16 has a music sheet-reordering puzzle that requires players to listen to parts of the openings to Ludwig van Beethoven's Fifth and Sixth symphonies, which can be difficult for players with hearing problems like that of the composer himself. Enabling "Hearing-impaired assistance" in the game options will change the descriptions of the different-colored sheets to their correct ordered positions, allowing deaf or hard-of-hearing players to complete the case.